Gražyna Pawlas Kaletová paints under the pseudonym Job D. Grash. She was born in 1955 in the Polish port city of Gdansk, where she completed a Bachelor´s degree in electroradiology. In 1979 she married and followed her husband to the Czech Republic. She has been painting since 1987. From her father Grash inherited her talent for art. She works with wood, leather and natural materials, and has gradually worked her way to oil painting. She combines structure and relief with oil and acrylic paints and creates her own style using abstraction, symbols and realistic elements. Her work astonishes onlookers with its wealth of schemes, its colors and its profound and pure arrangement. She has participated in a number of exhibitions in the Czech Republic. Grash´s work can be found in private collections in Europe and America. Her creations are valued most by fine, modern and sensitive art lovers. Her work is being shown in various galleries in the Czech Republic. 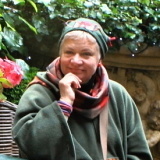 She was a long-time owner of art galleries in Tábor, Ústí nad Labem and Prague. She inherited from her mother an artistic flair for musical compositions. Her mother abandoned her career as a swing singer because of her four children.